Gearing up for “The Ultimate Thrill Ride” WrestleMania 33, this week WWE officially released their last Home Video offering for the month of March — “WrestleMania Monday”. The 3-disc DVD collection can be picked up right now across the United States where it is priced around the $17 to $20 mark both in stores and online, including here on Amazon.com. 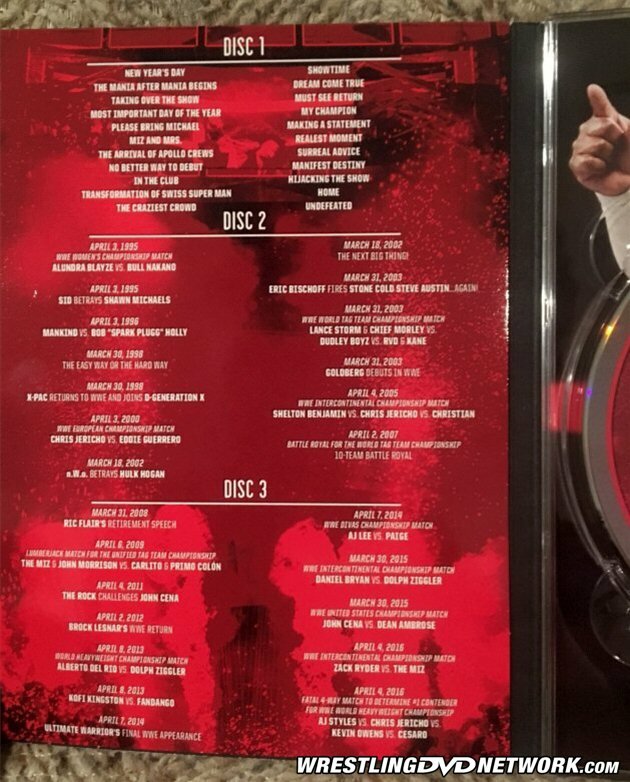 However, the 20-year look-back on the RAW after ‘Mania cannot be enjoyed on Blu-ray format as unfortunately the rumored cancellation of that edition was true, with Blu-ray product listings downed from the vast majority of U.S. retail sites the likes of Amazon, Best Buy, and Walmart! 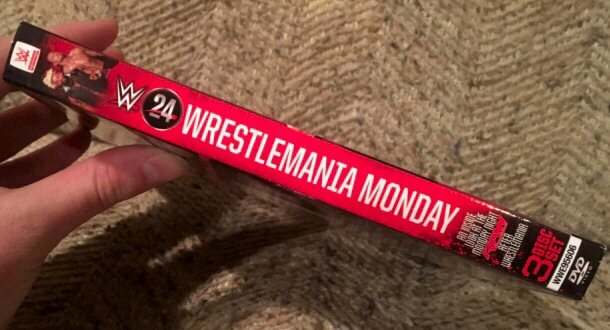 “WrestleMania Monday” features a “WWE 24” documentary special as its main feature which runs just short of 1 hour and, as of right now, is a DVD exclusive – until it hits the WWE Network. Extras wise, the compilation has 33 accompanying matches and moments witnessed in ‘Mania fallout. For those still curious about the “10-Team Battle Royal” extra, we can confirm that the list of matches includes both of the Tag Team Battle Royals held the night after WrestleMania 23, as well as the full segment involving Shawn Michaels and John Cena beforehand. Thanks goes out to WDN reader Matthew Tremble for sending in photos and to Kevin Edwards, Michael Bennett, “Number1JF”, and “JayTwoH” for also contributing to this post. The RAW after WrestleMania has become one of the most anticipated nights in sports entertainment. New Superstars emerge, familiar faces return, and the WWE Universe feels the fallout from The Showcase of the Immortals. For the first time ever, get a behind-the-scenes look and follow both WWE Superstars and spectators alike as they experience one of WWE’s most exciting events of the year. DISC 2: 2 hours and 31 minutes. DISC 3: 2 hours and 38 minutes. The Blu-ray edition releasing to the UK will include 1 hour and 22 minutes of additional content. – USA: OUT NOW! 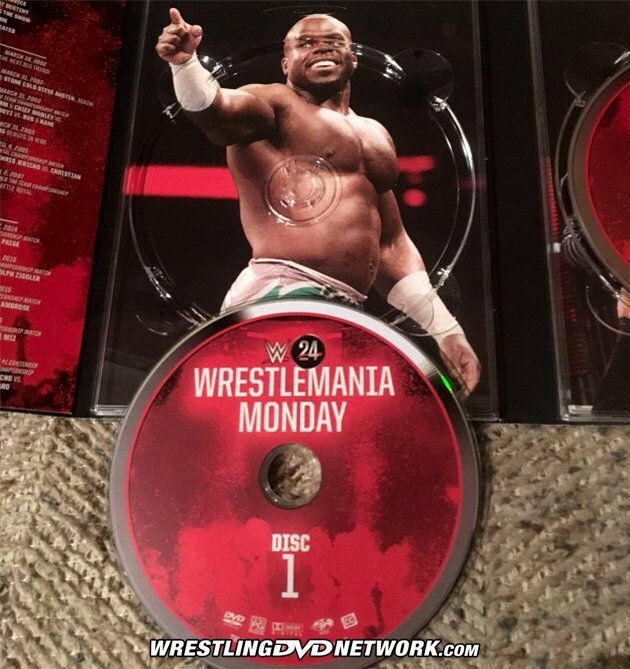 Grab the Mania Monday DVD right now here on Amazon.com. – UK/Europe: April 3rd. Pre-order Mania Monday on DVD (or Blu-ray) now via Amazon.co.uk. – Australia: May 24th. Pre-orders for Mania Monday are now live at Madman.com.au. 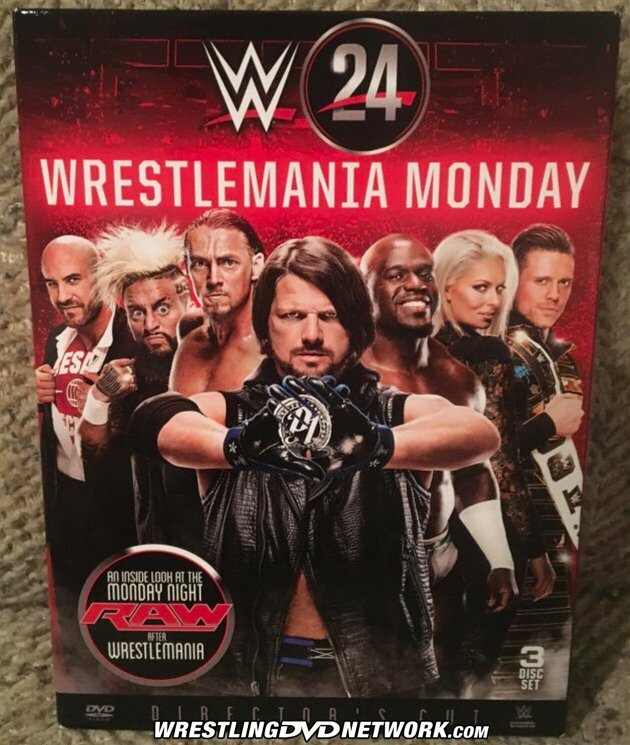 I just got the WWE 24: WrestleMania Monday DVD on WWEShop.com, I can’t wait to watch the episode! Update for ya – there are black sidebars. The reader that sent the news in was confused; we were able to see the sidebars in our own copy that arrived later. what was the confusion regarding? was he just talking about the documentary? because for that it makes sense that everything is presented in the same aspect ratio (including cropped footage that was originally shot in 4:3). i know what you’re saying. 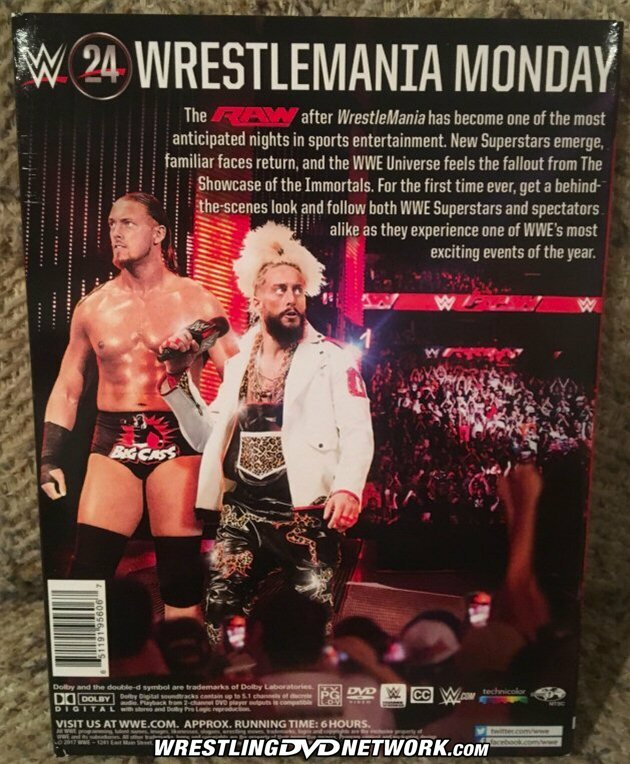 It’s almost like WWE doesn’t see a future in the physical format so they are just trying to piss off anyone that still wants it. It just frustrates me that they could have put 3 more hours of content on this disc. Not sure why there are only doing 6 hours. It’s the “9.99 Watered Down” era.. physicals are degraded to be appetizer only, sort of to make the Network subscription be more worth, where you can find everything, “uncut and unedited”, and pay for it in all eternity. This could easily be a two disc set but I guess they want to charge 3 disc set prices. I hate renting/leasing, that’s why most people buy a house or car. very broad generalization though: in a lot of parts of the world renting is very, very common. Just curious..which countries have a majority of home renters than buyers. Wait, then what does the pre-HD footage look like? I have a copy waiting at home. I’m watching it on a Blu Ray player. Is it going to look terrible? Maybe I should have watched this on the network. Are they doing this for the best of 2000 set? I want blu rays back. WTF? If there’s no sidebars on pre-HD footage, will that not make for a horrible cropped picture quality? On both the DVD and Bluray? The first disc of the Undertaker 20-0 release still has it beat by about 17 minutes. I watched disc 1 and the Sid-HBK segment from the day after Wrestlemania XI of my PS4 this afternoon and the image was very good but not as a Blu-Ray… This segment of Sid and HBK is presented in the entierty. We have the segment who was seen of TV and what’s happen during the commercial break and after the show was off the air. Those segment is from the WWF Superstar from the weekend after with commentaries from Vince McMahon. Okay. thanks for info.. Will get it on Bluray some day, and as long as it is not a terrible quality as the RAW 2009 set.. personally though, I prefer the sidebars since it makes sure that the whole frame is shown. Great to know about both Battle Royals. I was really hoping we’d get both.